Windows has since long had the accessibility feature known as Mouse Keys, which allows the user to move the mouse pointer and simulate mouse clicks using the numeric keypad keys. This Wikipedia article offers more perspective on the history of this feature, from its inception on Unix-driven X Window graphical terminal, to its adoption in mass-market Windows and Apple OS X. 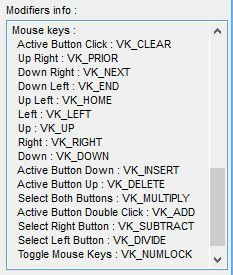 A less known fact about the Mouse Keys under Windows is that the keys used for specific mouse key functions (mouse left/right, button up/down, etc) are customisable. Even though mouse key customisation is not (yet!) supported by KbdEdit, a major change since version 18.9.0 is that any such customisations present in the original layout are now being preserved in any cusom layouts based on it. Additionally, since KbdEdit 18.9.0 the low level editor UI shows the details of all mouse key functions supported by the current layout. The only system layouts deviating from these standard mappings are the exotic "NEC" Japanese keyboards (kbdnec.dll, kbdnec95.dll, kbdnecat.dll, kbdnecnt.dll).